Upon reading this the second time, I knocked my rating down a star because I'd come to realize that I'd since read other fantasy books that I liked better. This book will always have a special place in my heart though for being one of the first YA fantasy that I truly enjoyed reading as an adult.The first person narrative is not typical for fantasy, but in the case of this book, it worked. The story started off with a bang and I felt like I was in the middle of the action the entire time. I'd highly recommend this book for the reluctant traditional fantasy. 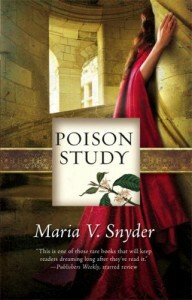 Poison Study is a great intro to fantasy. The book itself is less intimidating than other fantasy with heavier world and character building.I have a particular fondness for strong heroines. Yelena found her way into my heart much like Katniss did in the Hunger Games trilogy. Valek was mysterious, yet not completely inaccessible. If anything, the mystery made the reader want to know more about him. This was an intriguing story. It was quite the journey to watch a young woman slated for execution take the one opportunity for freedom handed to her - become a poison taster and face possible death anyway. This book had a bit of everything that I enjoy in a read - adventure, suspense and great character building - with a little bit of magic (and love) thrown in for good measure.